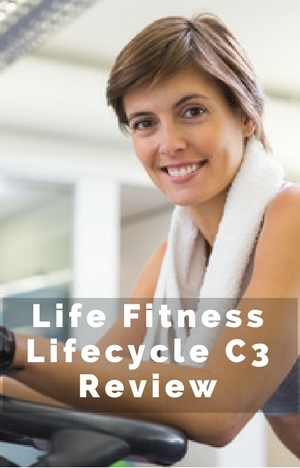 The Life Fitness Lifecycle C3 is premium priced upright exercise bike. You’d expect good things from a bike at this price. And it does come with some . But it is important to know what you are getting. It’s not going to be for everyone. It comes with a pre-set programs, display, magnetic resistance, belt drive and 22 lbs flywheel so comes with plenty that should provide an effective low impact cardio workout. The Go console looks good and the bike looks the part too. But there does seem to be some concerns expressed by customers in their reviews, that you wouldn’t expect from a bike at this price. In my review I check out how well it performs and who this bike is best for. And of course I look at whether it offers value for the money too. It weighs 118 lbs with a steel frame and crossbars that will hold you steady as you workout at whatever intensity you want to exercise at. So certainly has the weight for a stable workout. There won’t be any flexing or creaks that could distract from your exercising and videos or anything else you might like to do while you exercise. If the bike is rocking from side to side you can adjust the stabilizer feet at the back to balance up the bike which should stop this from happening due to variations in the floor. It does come with a good warranty length of lifetime on frame, 3 years on parts and 1 year on labor. The seat adjusts vertically to help in getting a good fit for pedaling to get the most effective position for your workout. There are markings on the pole to help with returning to your setting if it has been moved since you last used the bike. You just need to remember the number or you can mark it with permanent marker if you don’t want to do that. Making the adjustments is straightforward. It does need to be done off the seat. It only takes a few seconds involving loosening the adjustment knob and sliding seat to the height you want and then re-inserting pop-pin (in the knob) and tightening in place. When fully tightened up there is shaking or wobbling. The pin stops the seat from slipping. The bike will also accommodate people up to weight of 400 lbs which is higher than most other exercise bikes. It is difficult to find bikes that go over 300 lbs and you do need to pay extra for those that do. It would be better if the seat was also able to be positioned horizontally to make allowance for people’s different shapes (which you’d probably expect for the price) – to get closer or further away from the handlebars as well as find the most effective position for the legs. The 20 levels of magnetic resistance are controlled through the console either manually or automatically when following one of the pre-set programs. It does start off easy and gets incrementally harder until it difficult for all but the strongest athletes. If you are looking for very demanding workouts like a very tough hill climb you probably won’t find this bike is the one for you. The lowest levels do suit people who are just starting out or want a light workout. Most people will find the middle levels gives them a good cardio workout where they can get there heart rate up, sweat and get out of breath if they want. The transition between the levels is smooth so there are no sudden increases or decreases in resistance to worry about. The highest levels are hard but probably won’t be enough for those looking for the most challenging workouts but it will be tough for most. It has a poly v-belt drive which turns the 22 lbs flywheel. It provides a quiet and consistent feel to the pedaling. It is also low maintenance. The 22 lbs flywheel helps to keep the pedaling motion 360 degress by pulling the pedals through as you up the resistance levels – it should remain fluid although you may notice a little pulsing at the top of the resistance. These are enclosed which keeps them away from pets and children as well as protect them from dirt and dust getting into the works and jamming it up. The pedals have a non slip surface and strap for holding your feet in place as you pedal giving a good secure base for pedaling at the intensity you want. They are self-balancing too which means you don’t have to be flipping them over to use them when you get on the bike they are right side up. The straps are easy to use, with them using a spring loaded clip rather than the hole and tab system used by most over bikes. You just pull the strap to tighten and to loosen you push on the clip and pull on the strap. Once adjusted you can just slip in your feet if they’ve not be changed since you used the bike. The pedals are designed to work with athletic type shoes. The bike isn’t designed for you to stand on the pedals as you would with an indoor cycle or spin bike. It is made for sitting and pedaling. As well as not feeling right you are likely to reduce the life of the bike. If you are looking for this type of training you might want to check out the Lifecycle G3 or the Keiser M3i but they don’t have pre-set programs. Seat. The seat is large padded and contoured. Customers find it comfortable enough for sitting and exercising on for extended periods of an hour or more. However, what is comfortable is down to personal preference and nowhere is that more apparent than with a bike seat of whatever type. There isn’t a seat that everyone finds comfortable. If you do find it causing numbness and/or pain and getting in the way of an effective workout for the length you want then you can try padded bike shorts or a gel seat cover. If you are new to bike riding it may just be down to getting used to using a bike seat as it does take time to wear them in whatever the seat. It is possible to change the seat but it does take some work as it doesn’t have a standard bike fitting but is attached to the pole using 3 screws. To do it you can buy a universal bike seat adapter that then allows you to fit any standard fitting bike seat to the pole. Handlebars. The handlebars are covered to provide a good comfortable and non-slip grip even when hands are sweaty. They are shaped so you can lean on them if you want with angled end upper half for gripping while you place your upper arms on the bar. The handlebars aren’t padded so you probably will find your aching if you do it for long periods. The handlebars are fixed in place and the angle of them can’t be changed but they do have a good angle on them to give you plenty of grip positions to help cater for a variety of heights. Noise. The bike operates very quietly. The loudest noise may be heavy breathing from the user exerting themselves. It does mean you can workout and watch the TV without turning up the volume. You are unlikely to disturb others at any time of the day or night. If they’re sleeping you shouldn’t wake them unless they are very light sleepers. If you are in an apartment your neighbors aren’t like to even know you are exercising. To prevent any possible noise being transmitted you may want to put the bike on a rubber exercise mat to be even more sure of not annoying the people in the apartment below you. Dirt and Dust. The bike itself isn’t going to generate much cleaning work, it is more the people riding it. The biggest issue is going to sweat and wiping it up after use to stop the salt and water corroding the bike. It doesn’t take long to wipe the bike down. The other place that the sweat is likely to fall is the floor and if you want to protect them from the effects of it the best option is to place the bike on a rubber exercise mat. This isn’t the most compact bike nor is it that light. If you can’t leave it out then a likely place is in a corner or against a wall. it’s probably too big for most closets. To help with moving the bike which weighs 118 lbs there are 2 transport wheels on the front stabilizer bar. You tip the bike on to them and they hold most of the weight so one person can do move it around, it probably will be awkward if you have any tight corners to get round and you may need two of you to do this effectively and not over-balancing the bike. They wheels will work on most surfaces except on soft or deep pile carpets where they may jam or stick. Also, if you have a wood you may want to check if the wheels scratch or dent it because of the weight before moving it across it. It is delivered part completed. It will normally take between 1 to 2 hours to finish it but some may do it quicker. You do need to supply your own tools – with a metric wrench set, metric Allen wrench set and Phillips screwdriver recommended. The actual assembly itself isn’t too difficult and the hardest part has been completed when delivered. You’re required to add the back stabilizer, seat post, seat, front post, console, handlebars and accessory tray. It can be done by one person but it is easier with two so you don’t end up with the feeling that a third hand would be better. If you want you can have it assembled in home using the service offered by Amazon but it does cost extra. Feedbackindicate that most are happy with the assembly service they get and it gets high ratings. This version has the Go console it is possible to buy with Track+ which has more workout tracking by connecting with your mobile devices. It comes with a good sized LCD display at 6 by 4 inches. The measures and information are white displayed on a blue background. You can see the information easily from your seat. It has quite a simple display layout making it easier to work and not giving you too much to look at or do. The screen is split into two. The top half has 3 different sections. At the top it let you know the resistance level, elapsed time and speed (mph or kph). The next section tells you what program you are following. Next it tells you your distance traveled, heart rate, percent of target heart rate and calories burned. Heart rate measures only shown if you’re wearing the strap or gripping the hand pulse sensors. In the section below is a column in the left to graphically show the resistance level, then it shows you the profile of your run in a series of 24 columns across the rest of the screen with the height indicating the amount of resistance when using a preset profile workout. When using a heart rate workout it indicates the level of your heart rate max. There is an arrow above the column to let you know where you are up to. Below the display are the buttons for controling and setting the workouts you can do. Pause/Resume – you can press this button to pause a workout for up to 5 minutes. To restart the workout in that time you press the button again. If not resumed in that time the workout is deleted and the bike goes into energy save mode. Navigation Buttons – this is used for moving through the set up menus before your workout. Once in a workout they can be used to scroll through option including resistance level and then increase or decrease depending on how you want change it. Reset Button – is used when you want to clear incorrect data if you’ve got your weight or age wrong etc. Goal Workout Button – used to set goals for workouts of either calories, time or heart rate. There are 3 levels of programs available – beginner just starting, experienced fit and advanced athlete. The advanced athlete are for people training for cardio endurance events and other special events. They are going to be tough but may not suit very advanced athletes as you would get on an indoor cycle. Quick start – where you the resistance level doesn’t change automatically you do this manually using the navigation up/down buttons. Next are workouts for use with using heart rate monitoring – cardio workout which aims to keep you heart rate at around 80% of max heart rate by adjusting the resistance level. Then there is heart rate hill where it is your heart rate as percent of max heart rate is used for the hill There is also an interval heart rate which uses you heart rate to determine the intensity and level the resistance is set at. Then there is the extreme heart rate program which works in a similar way but moves quickly between intense and recovery with a similar effect to sprints. There are 3 goal workouts that are similar to manual workouts where you set goals for distance, calories and heart rate goal. Plus, there are 2 custom workouts – one for each user. You can set up a profile type workout (where you select resistance level over 24 time intervals that 1/24th each of the time you choose) or heart rate workout which is the same as the profile workout except the intervals are set at the heart rate you want to achieve. When you select a race mode you determine the speed and you then have a pacer arrow that moves across the graphic workout profile in the display – there outline arrow indicates the pacer and the filled in arrow is you. The workout programs certainly do give you plenty to challenge you as well as help you stay on track or just give you variety. The pacer idea I’d find motivating to keep my pace up which is not something that is found in many other programs available. The manual is good in that it describes the workout, has a profile picture of the workout and lets you know what the aim of the workout and who it for. It makes it easier to select the one for your fitness level and goals. It doesn’t save your workout results so you need to take a record of them separately. The bike console is self-powered so you generate the power and you place it where you want. You’re not tied to a power outlet and it also means there isn’t trip hazard too – no cord to trip over. You also don’t have to worry about replacing batteries. You can also plug it in if you want and this can help when you are setting up your profiles or making other changes so you can just concentrate on this without having to pedal to keep the charge up. It doesn’t work with any Apps or connect with any fitness accounts. If you want to record and track workouts over time you’ll have to do this manually. You can monitor your heart rate two ways either using the hand pulse sensors on the handlebar cross piece or wearing the included heart rate strap. It’s great that the bike gives you the option to wear a heart rate strap and it is included with the bike. The hand pulse sensors do restrict where you can put your hands as both need to be gripped to get a reading. As with all hand pulse sensors on exercise bikes they’re not always reliable. Some people just can’t get them work for them on a consistent basis. The heart rate strap will give you an alternative that provides a good reading and you don’t have to worry about where you put your hands when you want to monitor your heart rate. It doesn’t come with much in the way of accessories which is a little surprising considering the cost and what is available on cheaper upright exercise bikes. There are just the two with this bike..
Media Shelf. This can fit tablets, iPads or a book but it does cover up the display so you can’t monitor your workouts. With the bike being steady there should be no issues with them dropping off. There isn’t any where to plug in to charge the device or to use speakers. The bike is very quiet so you should easily hear your device without having to turn them up. Dual Water Bottle Holder. This sits between the handlebars and the console. It will fit two large water bottles but it may get in the way of you using the console a little with two bottles. You can also use it for an IPod, keys, TV remote or cell phone. It does put them all within easy reach. The bike console can be used to self generate power which does restrict the accessories such as a fan, speakers or recharging. There is also no bluetooth to use the bike with a Fitness App. There are very few customer reviews for the bike, which may reflect the price, and those that have been left are surprisingly mixed. You’d hope a bike at this price that customer ratings would be better and some of that may come down to the price. A couple of people have had a problem with pedal clicking as you pedal. One reviewer has done a lot of good work in solving the issue and detailing the fix (they noticed it in 3 bikes.). It’s not reported in any other review outside these two. The person who did all the work on the pedal is otherwise very pleased with the bike and the service they received. There is one person who doesn’t like the seat, which happens with all upright exercise bikes. People are pleased with the good quality feel of the bike and workout. They feel they can get on it and workout when they want and for as long as they want. But do check out one customer’s experience in the comments below before buying. This is a premium priced upright exercise bike and you are getting a bike that has a lifetime warranty on the frame, that can support people up to 400 lbs (there aren’t many that do that). It seems it is going to be durable and reliable, has chest as well as hand pulse sensors for heart rate monitoring, a good clear console with a variety of pre-set programs as well as customized. And it can be used when you pedal for self generating power so there is no need for batteries or power cords (but you can if you want). There is a strong possibility that you won’t wear the bike out as you may with the other more economical priced bikes with more features. It is the stronger build and durability that is included in the price. It does give some peace of mind although there was an issue experienced noted in a couple of reviews. The price of the bike is probably for people who take their training very seriously. But, it can be used by beginners. The resistance can be adjusted to be very easy to help you as you get started. It does provide you with variety in your workouts if you like to follow along with programs. You can also set your own. Or just get on the bike and workout as you want. But, I still would have liked to see more extras but it is self generating power and you’d have to pedal faster to generate the power unless you chose to plug it in. That aside it is worth having if you want a bike that can take the rigors of workouts and be with you a long time. This is an upright exercise bike that you can get cardio workouts that can be easy or hard as you want. They are low impact, quiet and solid. It is made of heavy duty steel so you should get years of trouble free use. We have had nothing but trouble with our C3 bought from John Lewis three years ago. After daily use for some months the pedals started slipping and we suspect clutch failure. Repair costs and call out rates are close to the cost of the original machine and warranty terms re strictly applied to. We now can’t use the machine except at the lowest stress levels and even then we get slippage. My suggestion is that if you are in any way serious about using the machine at reasonable fitness levels, don’t buy one of these, go for a walk instead. Sorry to hear about your troubles with the bike. Did you let John Lewis know? Thanks for letting me know.